Kidneys perform the important function of excreting nitrogenous waste products and regulating the volume and composition of body fluids. When kidney function is impaired, these functions are affected. There is retention of nitrogenous waste products and disturbance in fluid, electrolyte and acid-base balance. Dietary modifications can minimize these changes. The complications of chronic kidney disease (CKD) that respond to dietary modification include hypertension and volume overload, azotemia, acidosis and hyperkalemia, hyperphosphatemia and hypocalcemia, hyperlipidemia and malnutrition. It must be stressed that not all patients have all complications of CKD and a common CKD diet does not exist. The diet recommendations must be individualized for each patient. The kidneys are bean-shaped organs, each about the size of a fist. They are located near the middle of the back, just below the rib cage, one on each side of the spine. 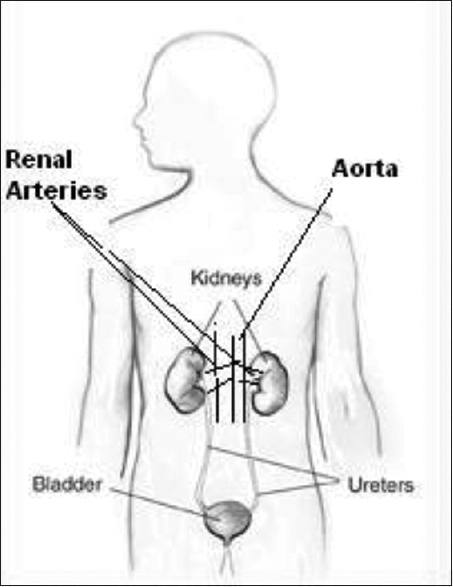 The kidneys receive blood through renal arteries [Figure 1] which are branches from the aorta (the large blood vessel which originates from the heart to supply blood to all parts of the body). As blood flows through the kidneys, they remove wastes and water from the blood to form urine. The purified blood returns back by renal veins while urine flows from the kidneys to the bladder through the ureters. The bladder stores the urine. When the bladder is full, a sensation is felt and one goes to pass urine. In each kidney there are about 1 million functioning units called nephrons. A nephron is made up of a glomerulus and the tubule. As blood passes through the glomerulus, a protein and cell free ultra-filtrate is produced. As the ultra-filtrate moves down the tubule, most of the water and salts are reabsorbed in such a way that the volume and composition of body water remains constant. Normally, about 1 L (20% of cardiac output) of blood flows through the kidneys each minute. Out of this, 100 ml of protein and cell free ultra-filtrate (GFR) is produced by the glomeruli. As this ultra-filtrate passes down the tubules, most of the water and salts (almost 99%) are reabsorbed and 1 ml per minute of urine is produced (with usual intake of 1.5 to 2 liters of fluid a day). If the fluid intake is high (e. g. if one drinks too much water – 5 liters a day) more urine (dilute urine) will be produced to throw out excess water to maintain constant body volume. On the other hand if fluid intake is low (500 ml a day) a highly concentrated urine will be produced. Similarly, if one takes more salt (usual salt intake is about 10 gm/day), more salt will be lost in urine and if the salt intake is reduced, less salt will be lost in the urine. This regulation is achieved by the tubules of the nephrons. The glomerular filtration rate remains the same irrespective of water or salt intake. Calcitriol, the active form of vitamin D, which helps maintain calcium for bones. Acute kidney injury (AKI) or acute renal failure (ARF) as it was called before can be defined as an abrupt reduction in kidney function. This is associated with rising BUN and creatinine. It may or may not be associated with oliguria (reduction in urine output). It is rarely an isolated disease process (drug toxicity) and is most often a complication of sepsis, trauma, or surgery. In the ICU, AKI is usually seen in patients as a part of multiple-organ failure. Patients who develop AKI, especially in the ICU are at risk of protein-energy malnutrition, which is a major negative prognostic factor. Thus, adequate nutritional support is considered a key element of the overall therapeutic strategy. Since AKI is seen in a highly heterogeneous group of subjects with nutrient needs widely varying even along the clinical course of the same patient, nutritional requirements should be frequently reassessed. Loss of nutrients during dialysis in those needing dialysis. The increase in inflammatory and catabolic illness and impairment of kidney function results in metabolic and hormonal derangements which include hyperglycaemia and insulin resistance, catabolism of skeletal muscle proteins with increased amino acid turnover and negative nitrogen balance, altered lipid metabolism, water, electrolyte and acid–base metabolism disturbances. During hemodialysis, energy is lost due to the heat that is generated as blood travels through the dialysis circuits and the inflammatory response that arises when blood comes in contact with hemodialysis membranes. There is also loss of blood glucose into the dialysis fluids. Daily glucose losses into the dialysate fluid can range from 200–400 calories/24 hours depending on the blood glucose concentration of the patient and modality of dialysis (intermittent hemodialysis or continuous renal replacement therapy). Hemodialysis also results in a loss of 6–12 g of amino acids and 2–3 g of peptides per dialysis session. Continuous renal replacement therapy (CRRT) causes a significant loss of water-soluble, small molecular weight substances including vitamins and several other nutrients. The total daily loss of amino acids may be up to 10–15 g in such cases and there can be electrolyte derangements like hypophosphatemia and hypomagnesemia. Levels of trace elements (essential micronutrients with regulatory, immunologic and antioxidant functions) can be lower than normal in AKI. However, the precise requirements have not been clearly defined. Water soluble vitamins are lost during RRT and need to be supplemented. No supplementation of fat-soluble vitamins is usually necessary in AKI. Derangements in fluid, electrolyte and acid–base equilibrium, such as hypo-and hypernatraemia, hyperkalaemia, hyperphosphataemia, metabolic acidosis, etc., commonly occur in critically ill patients with AKI. Intensive (daily) RRT can readily correct these abnormalities. The RRT may induce hypophosphataemia and hypomagnesaemia, abnormalities that can be prevented by adequate supplementation. Chronic kidney disease is defined as having some type of kidney abnormality or “marker” such as protein in the urine, and having decreased kidney function for three months or longer. The disease progresses over time based on the type of disease and the care taken to slow the progression. The [Figure 2] shows the stages of CKD. The common causes of chronic kidney diseases are Diabetes Mellitus, Hypertension, Glomerulonephritis, Cystic diseases and Hereditary diseases. As CKD progresses [Figure 3] the various functions of kidney are compromised and will have an impact. For nutritional management of CKD, one must first understand the complications of CKD. These include 1) hypertension and volume overload, 2) azotemia, acidosis hyperkalemia, hyperphosphatemia and hypocalcemia, 3) malnutrition, and 4) hyperlipidemia. It is widely believed that malnutrition develops in patients with chronic kidney disease (CKD). However, not many realize that CKD is a spectrum with near-normal kidney function at one end and very poor kidney function requiring renal replacement therapy at the other end. While nutritional status is almost like that of healthy subjects in early stages of CKD, in advanced stages of CKD, malnutrition develops. Therefore, nutritional management will have to vary according to the severity of CKD. One should also keep in mind the nutritional status and appetite of an individual while advising a diet. We recently determined body-mass index (weight in kilograms divided by the square of the height in meters) of patients in different stages of CKD. There were 560 adult patients, 350 male and 210 female with mean (SD) age 55.2 (15) years. 15 patients had stage 1 CKD; 25, stage 2; 181, stage 3; 209, stage 4 and 130, stage 5. The mean (SD) BMI of patients with stage 1 CKD was 31.86 (5.55); stage 2 CKD, 28.06 (5.03); stage 3 CKD, 28.07 (4.7); stage 4 CKD, 25.3 (4.04); stage 5 CKD, 22.5 (4.7). This confirms that nutritional status of patients as judged fromBMI is good in early stages of CKD (stage 1 to 3) and tends to drop only as CKD advances (stage 4 and 5). One of the main reasons of worsening nutritional status in advanced stages of CKD is decrease in energy intake. We analyzed energy intake from diet recall and diet diaries in 100 subjects with CKD. The mean energy intake was 25 + 8.6 Kcal/kg/day. The cause of lower energy intake is unclear but is likely to be due to anorexia of CKD and various dietary restrictions. Energy expenditure of nondialyzed individuals with CKD is similar to that of healthy individuals. Metabolic balance studies of such individuals indicate that a diet providing about 35 kcal/kg/d maintains neutral nitrogen balance and maintains serum albumin and anthropometric indices. Note that energy intake is prescribed based on patient's ideal body weight (IBW). Because individuals more than 60 years of age tend to be more sedentary, a lower total energy intake of 30 to 35 kcal/kg/d is acceptable. Abnormalities in lipid metabolism occur in patients with all stages of chronic kidney disease. In the early stages of CKD (stage I to 3), dietary modification should be similar to that of hyperlipidemic subjects without kidney disease. In advanced stages of CKD (stage 4 and 5), dietary modification may be difficult because it may reduce energy intake. Lipid lowering medicines will be required in these subjects. End Stage Kidney Disease (ESKD) is also known as chronic Kidney Disease-stage V (CKD-V) when the glomerular filtration rate (GFR) less than 15 ml/min. Dialysis or Renal transplantation, without which survival is not possible. Treatment options of End Stage Kidney Disease and metabolic implications. Malnutrition is not uncommon in the dialysis population. Both cross sectional and longitudinal studies suggest that two-thirds of patients on hemodialysis and continuous ambulatory peritoneal dialysis are malnourished. Surveys using classic measures of nutritional status indicate that approximately 18-75% of patients with end stage kidney disease ESKD undergoing renal replacement therapy in form of dialysis show evidence of protein energy malnutrition (PEM). PEM occurs when mechanisms to compensate for decreased protein intake fail. PEM occurs frequently in patients with stages 4 and 5 CKD and established hemodialysis or peritoneal dialysis patients. Dietary protein and energy intake and the parameters of nutritional status (including serum albumin, transferrin, body weight, midarm muscle circumference, and percentage of body fat) decrease as GFR decreases toward 10 mL/min/1.73 m2 (0.167 mL/s/1.73 m2). Nutritional status of patients undergoing maintenance hemodialysis or peritoneal dialysis is a powerful predictor of morbidity and mortality. Serum albumin, weight, muscle mass, and changes in body weight are associated with morbidity and mortality. Co morbid conditions often account for both the PEM and increased mortality. Individuals with lower muscle mass may be less likely to survive acute intercurrent illnesses. The term “reverse epidemiology” describes lower mortality with higher body weight, cholesterol level, and other traditional cardiac risk factors that is believed to be caused by PEM. In the dialysis population, high BMI, blood pressure, and cholesterol seem to be associated with better survival. While obesity, hypertension and hypercholesterolemia are well-established harbingers of poor cardiovascular health and death, so-called reverse epidemiology holds that these physiological states actually increase the chance of survival in patients on dialysis. 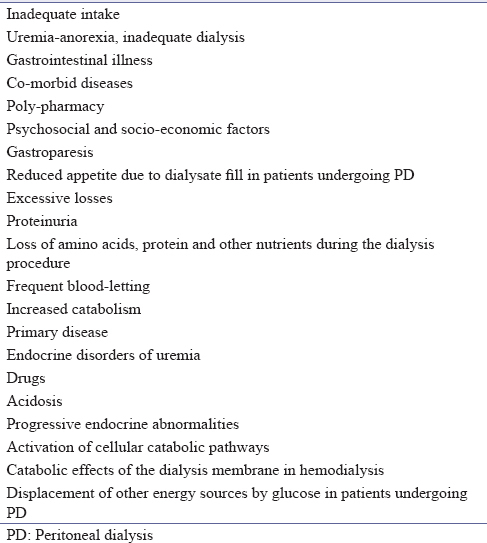 Factors contributing to malnutrition in dialysis. Once dialysis is commenced a number of mechanisms, in addition to those in CKD promote progressive malnutrition in both hemodialysis and peritoneal dialysis patients. Collectively, these mechanisms include inadequate intake, excessive losses and increased catabolism. The causes are further elucidated in [Table 1]. In peritoneal dialysis especially continuous ambulatory peritoneal dialysis (CAPD), due to continuous glucose load associated with glucose based dialysate, the abnormalities in carbohydrate metabolism are amplified. Up to 20% of carbohydrate intake comes from the peritoneal absorption of glucose, resulting in persistent hyperinsulinemia, which is reflected by increased C-Peptide levels. The constant energy source may lead to obesity but paradoxically may exacerbate malnutrition in some patients due to loss of appetite, and specifically protein intake. Derangements in the carbohydrate metabolism, including reduced gluconeogenesis and ketogenesis, inhibition of lipolysis, elevation of glucagon, alanine and lactate concentration cause further abnormalities in nutrient utilization. In patients with high peritoneal transport rates the worsening malnutrition observed may be at least partly induced by excessive peritoneal glucose absorption. Glucose losses during HD are reported to be approximately 25 gm. Aminoacid losses during HD range between 2 to 8 gm free amino-acids and 2-5 gm peptides per dialysis session. The loss is greater with high flux-polysulphone membranes. The number of reuses and processing with bleach increases the pore size and hence increases the albumin loss during HD. The importance of the loss of aminoacids, albumin and glucose are a small part of the daily requirements, but assume importance in HD patients who have a compromised intake. Losses of water soluble vitamins in the dialysate also occur and hence need to be supplemented. The substantial losses of proteins (5-15 g/24 h) from the peritoneal cavity contribute to the negative nitrogen balance often observed in peritoneal dialysis. These losses increase substantially in peritonitis, resulting in vicious cycle of worsening malnutrition and an attendant increase in susceptibility to infection. Serum amino acid profiles are similar in patients on PD and hemodialysis. Decrease in serum of essential amino acids with decreased ratios of valine to glycine and tyrosine to phenylalanine are observed. Up to 3.4 g of amino acid are lost in the dialysate in patients on PD. Substantial increases in plasma levels of N-and O-carbamoylated amino acids which may inhibit protein synthesis have also been reported in PD. Acidosis accelerates the malnutrition associated with a decreased dietary intake in chronic kidney disease. Acidosis promotes malnutrition via dual metabolisms of increased muscle degradation, by up-regulating enzymes involved in these catabolic pathways and a reduction in ability to limit oxidation of essential amino acids. Cellular mechanisms promoting protein catabolism are shown to increase catabolism, especially the ATP-ubiquitin-proteasome proteolytic and branched chain ketoaicd dehydrogenase pathways. Acidosis is also known to decrease the albumin synthesis, which may directly or indirectly relate to increased mortality in CKD that is associated with low serum albumin. Correction of acidosis has been shown to result in reduction of protein catabolism by 28-30%. It is possible that the catabolic effects of acidosis are counterbalanced by the anabolic effect of increased dietary intake of aminoacids. Treatment of acidosis also results in improvement of the muscle mass. It has been recently shown that the average of the post and pre-dialysis bicarbonate concentration accurately predicts the time-averaged interdialytic concentration. Stein et al. found in a randomized controlled trial that CAPD patients using high alkali dialysate (40 mmol/L lactate) had greater increase in anthropometric measurements in comparision to patients treated with a low alkali dialysate (35 mmol/L). Similar improvements are also seen in hemodialysis patients where high alkali dialysate is used. A pragmatic goal would be to maintain this average within the normal range. It was suggested in 1970s that nitrogen balance was negative on dialysis days regardless of the protein intake and that the urea generation increased during HD. Studies in normal subjects undergoing “sham” HD revealed that amino acid efflux was increased in subjects dialysed with “biocompatible” cuprophane membranes. In contrast there was no increase in amino acid efflux when “biocompatible” polysulphone or cellulose acetate membranes were used. It has also been suggested that the catabolic effects of hemodialysis are due to suppression of whole body protein synthesis and dialysate losses of aminoacids. The role of cytokine release as a catabolic stimulus in PD patients in unclear, but is probably less important than in HD patients. A well dialysed patient will always be a healthy patient. This is true is shown by studies which use measures of dialytic and renal clearance and or nutritional state independent of urea kinetic modeling, that the relationship between total clearance and protein intake exists. In the CANUSA study in subjects on peritoneal dialysis, creatinine clearance correlated positively with the protein intake; however these effects could not be dissociated from the effects of a higher residual renal function. Longitudinal studies in which Kt/v is increased and a higher steady state PNA is reached confirm that a measured change in nitrogen balance is achieved. In hemodialysis population, high predialysis serm cortisol has been associated with increased rate of hospitalization and presence of markers of a catabolic state. A low T3 has been reported in malnutrition in dialysis, but may also have protective effects on protein catabolism in CKD. Decreased levels of biologically active anabolic hormones (e. g. Insulin, Somatomedins) and increased activity of catabolic hormones (e. g. Glucagon, PTH) may contribute to malnutrition in patients undergoing peritoneal dialysis. Similar hormonal disturbances are likely to be inherent in ESKD and to extend to CAPD population. Insulin like growth factor-1 (IGF-1) levels are generally normal in patients with CKD, but there are marked abnormalities in the growth hormone-IGF-1 axis. Many hemodialysis patients show evidence of chronic inflammation, with intermittent or persistently elevated levels of acute phase proteins, C-reactive proteins (CRP) being the one most widely used in clinical practice. An elevated CRP is often accompanied by decrease in serum albumin, which acts as an inverse acute phase protein. Blood-membrane interactions are known to result in complement activation and release of cytokines from macrophages. There is substantial evidence that dialysis with complement-activating membranes has an acute catabolic effect. This may be through both a decrease in protein synthesis and an increase in breakdown mediated through cytokines like tumor necrosis factor-α (TNF-α) and interleukin 1(IL1). Membrane compatibility was assessed in few studies. It has been hence suggested that biocompatible membranes be used to decrease the protein catabolism. Peritoneal dialysate which is bio-incompatible is more likely to stimulate cytokine production from peritoneal mesothelial cells, as well as through the activation of monocytes and neutrophils, which contributes to increased catabolism in CAPD. Pro inflammatory cytokines (IL-1, IL-6, TNF) appear to play a pivotal role by causing muscle wasting, hypoalbuminemia and anorexia, as well as cardiac contractitilty and atherosclerotic vascular disease. Apart from the traditional risk factors, low vitamin E levels, as mentioned earlier elevated. C-reactive protein (CRP) levels are associated with increased carotid intima-media area and hence increase in cardiovascular morbidity and mortality. Kidney insufficiency causes an adverse impact on various aspects of nutrition and can impact the morbidity and mortality. Malnutrition and inflammation are common complications of chronic kidney diseases and ESKD patients on dialysis. These are associated with increased morbidity and mortality in patients suffering from CKD and those with ESKD on maintenance dialysis. An appropriate diet with appropriate assessment is required at each stage of kidney disease based on the co-morbidities.